Every third Thursday of the month the St Edmonds KCA and the Knights of Columbus Council enjoy a meal prior to our individual meetings. Our Rosary begins at 6:00 pm and a meal at 6:30. The meetings are immediately following at 7:00 pm. The St. Edmond Kaycee Council of Auxiliaries (KCA) is affiliated with the KCA of Louisiana, Inc., which chartered in 1975. The aims and purpose of Council Auxiliaries are to assist the Knights of Columbus, to promote good fellowship through religious and social activities and to participate in the KCA of Louisiana projects. Membership in the St Edmond KCA is limited to any female who is at least 19 years or older and related by blood or law to a Knight in good standing with the council. The Auxiliary helps with the yearly KC barbecue and Tootsie Roll drive for the mentally handicapped. 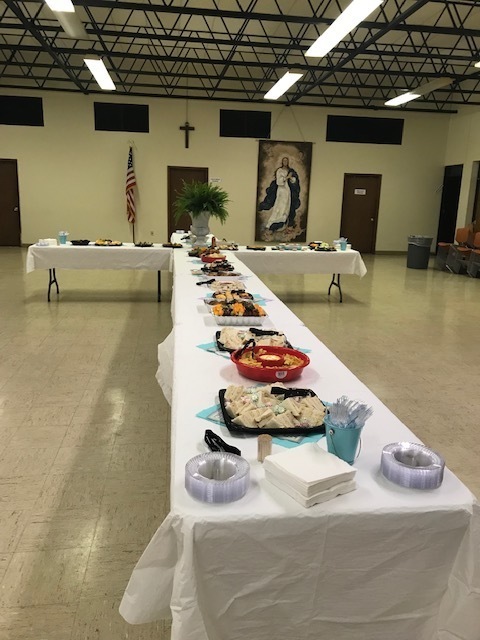 We periodically donate to the church pantry and participate in projects promoted by the Kaycee Council of Auxiliaries of Louisiana such as "Pro-Life" involvement. For more information CLICK HERE to see our brochure, or call Yvonne Green at 337-984-8171.